A Google search across the literature concerning Safe Patient Handling reveals a consistency that is both compelling and shocking. Somewhere between 6.8 and 7.6 percent of all nurses and other clinical staff suffer from musculoskeletal disorders and injuries (MSDs) that can be traced directly to overexertion in patient transfer and repositioning activities. Lifting and moving patients in the clinical environment, especially in the age of obesity issues across the United States, is clearly a dangerous activity. The results of such injuries are life-changing for clinical staff members, affecting more than just the ability to physically perform on the job. Other documented effects include shorter attention span and lower morale. The organizational symptoms around the advent of MSDs are obvious: lost workdays, and higher, more frequent compensation claims. Beyond those measurable issues though, lie other, more indirect effects, such as shortened careers for experienced and otherwise highly capable staff members. Safety trumps all….in the millions of moment-to-moment decisions we make each day. In recent years, a new way of thinking has evolved around the epidemic of MSDs in medical centers and other care environments. According to the Washington State Nurses Association, the evolving discipline focuses on the use of engineering controls, lifting and transfer aids, or assistive devices, by lift teams or other staff — instead of manual lifting to perform the acts of lifting, transferring, and repositioning of patients. This discipline is referred to as Safe Patient Handling, and has become an area of concentration for such organizations as the Center for Disease Control and OSHA. The literature is broad and is expanding every day. Evidence-based research is available on the Internet to anyone in the medical community and beyond. Wy’East Medical has a long history in supplying innovative equipment and training around Safe Patient Handling. The TotaLift, for example, is a stretcher used for lateral transfer of the patient from bed to stretcher. 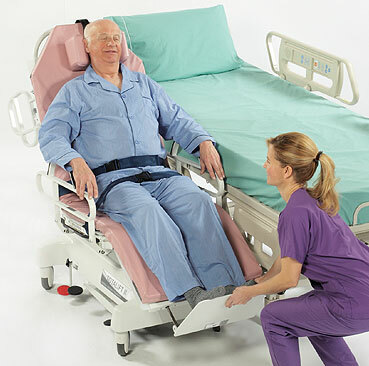 The TotaLift then converts easily into a transfer chair for movement through the medical facility. Repositioning is also frequently mentioned in the literature. To help with this challenge, Wy’East developed the Pink Slip, a friction-reducing device – along with compliance-based training to support its use. These key products are surrounded by other stand-assist lifts, slings, and a broad family of accessories. Through it all, Wy’East has kept its eye on the discipline of Safe Patient Handling, watching for ways to bring its considerable technical expertise to bear on the problems faced by caregivers in medical centers. The case for implementing programs to support Safe Patient Handling practices is clear. Acquiring the right equipment, positioning it near the areas of high use, training clinical staff in its use, and measuring compliance will make a measurable and positive difference in the gradual elimination of MSDs. And when it comes to retaining experienced clinical staff, it’s more than numbers. It’s the right thing to do.